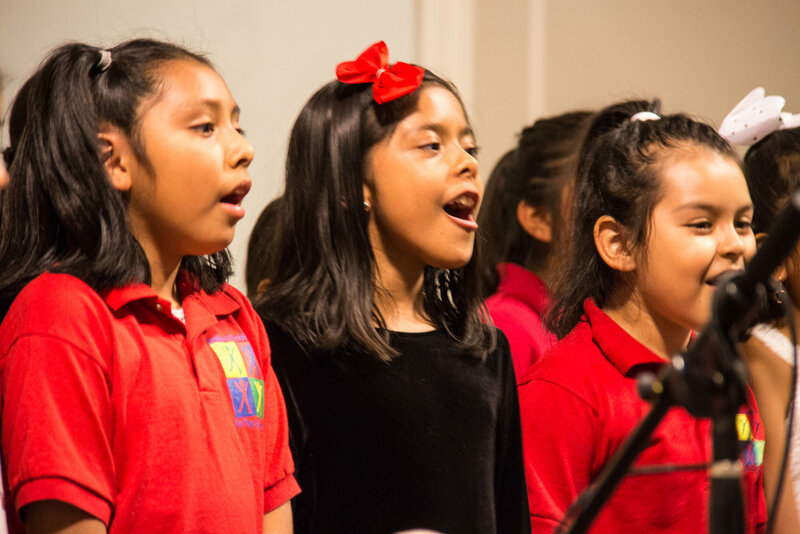 Throughout the year, YMF provides music instruction to nearly 3,400 pre-K through adult students at 25 partner schools and sites in the greater Los Angeles area. Working to provide long-term sustainable solutions for music education, YMF partners with schools and organizations that have a need for music programming. These partnerships create a network of pathways for our students to follow according to their individual musical identities, talents, and interests. Guided by a framework of benchmark music skills and the Visual and Performing Arts Standards in Music, our approach to Early Childhood and General Music education emphasizes exploration and play through music. Our program develops the whole child by providing opportunities for children to exploring fundamental music concepts in a safe and engaging environment. Instrumental and vocal instruction to 4th through 12th grade students. Instrumental students receive instruction in strings, including guitar, brass, woodwind and percussion. Vocal students receive solo coaching, small-ensemble instruction, and participate in acapella groups and large vocal ensembles. Our programs approach music from all aspects of learning. Students create, perform, improvise, collaborate, and more as they work with our dedicated Teaching Artists to master their instrument and develop a lifelong love for music. Percussion Ensemble is a collaborative class with a focus on percussion technique and rudiments. Students learn the fundamentals of music through practice and performance, sharing their work in exciting collaborative performances. Our percussion ensembles perform on a variety of instruments, everything from traditional snares and drumline equipment, to buckets and pandeiros. Capoeira Music and Movement is a program that engages students through an interdisciplinary approach as they learn about the roots and elements of the Afro-Brazilian Capoeira. Skilled Teaching Artists lead a program that offers participants an opportunity to explore through movement, play, improvisation, and creation of instruments. Music Technology programs explore the ways in which music engages with technology through composition and the performance process. From production and recording, to songwriting and beat-making, students combine their knowledge of music, innate creativity, and modern technology as they learn and create. Homeboy Industries already offers former gang members harmony through hope, training and support. Now, the Young Musicians Foundation is offering them harmony through music. In October 2017, the Mike Stoller and Corky Hale Music Heals Program began at Homeboy Industries in L.A. YMF is providing music instruction in guitar, keyboards, voice, songwriting, drums and percussion. The program is a holistic integration of instrumental and ensemble coaching and experience that allows each student to deepen the connection to their innate creativity and inner voice while giving them means to structure, record and refine their creative expression through learning and utilizing cutting-edge music production tools.